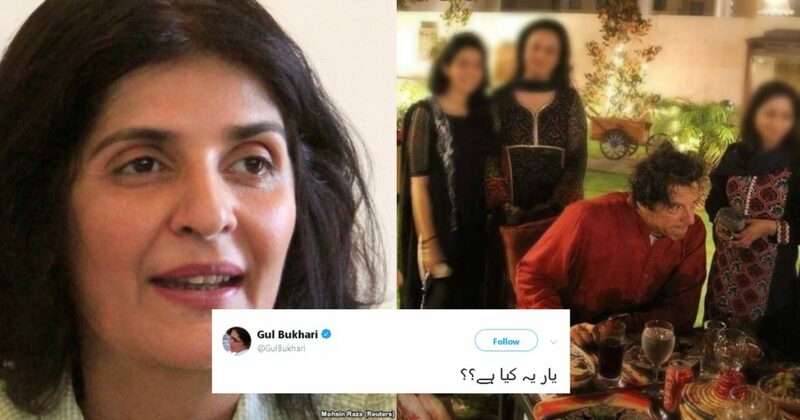 Gul Bukhari Just Leaked A Weird, Personal Picture Of PM Imran Khan And Pakistanis Are Extremely Angry! Imran Khan’s progress has been quite evident by all the people. Recently, a survey was conducted from common Pakistanis, where a vast majority of people were happy with whatever little efforts has been made for progress. Imran Khan’s struggles for decades is known by everyone, by his followers and his haters. Long before becoming the PM, he had been working towards his passion for health and education. Shaukat Khanum Memorial Hospital and Namal are the examples of his prominent works. But no matter what a person does, there are always haters! So, Imran Khan too has haters as well. Well, some of his haters are very dedicated, by that it means they are very passionate to hate him and throw news about him; which somehow are not even related to him. But the worst part is that while throwing hate at him, the haters usually forget that they are defaming other innocent people too. This is the best example to show this! Gul Bukhari the famous columnist posted this of Imran Khan! Umm… He makes some sense! Posting photos of other women just like that is not good! I have known you since we were in school & it’s really shameful what you have become Baby. All that you tweet just makes you look bad and no one else. You need to have a deep look into yourself and realize what you have become & what you are wasting your life doing. This is wrong because posting some women photo just to defame Imran Khan doesn’t sound sane at all! u have no shame & have no idea how u r maligning all the ladies in this pic. feminism is just a blank cheque for u all. no principle & grace at all.. But when in return people countered Gul Bukhari, she laughed at all of them. But did she reply to the people who questioned why she posted other women photo? Eh?! The internet can be crazy sometimes, mocking and bashing is a daily drill on twitter. No days passes without defaming anyone! Do you guys have anything to say? Let us know in the comments below!